Duracell has launched its Christmas ad campaign, highlighting that Christmas morning is way too important to trust anything but Duracell. One of the spots features Santa the night before Christmas in his own home, putting Duracell batteries into stockings and imagining what his life would look like if he hadn’t used Duracell batteries in various items around the house. The old man, who’s actually quite young and thinner-looking, with hipster curly hair and short white beard, pictures then his teenage daughter getting angry because she can’t play her electric keyboard, his young son’s joy vanishing as the remote controlled dinosaur dies, and his wife tripping over the respective toy and falling over the Christmas tree, whose lights are not lit. 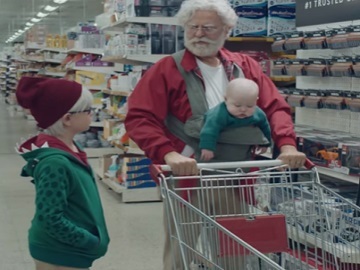 The campaign, titled “Trust Is Power” and created by Wieden + Kennedy New York, also includes another commercial, which features Santa and his two youngest kids in the battery aisle. After getting lots of Duracell batteries, at the North Pole Mart, Santa is also seen competing with big guys and angry elves for toys, and eventually getting a lighted sweater as he carts his little ones through the store. While the first spot, directed by Ulf Johansson, runs on broadcast and digital channels, the second one, “Battery Aisle”, runs online and in social.